Although the weather is still cold, the worst part of winter is now behind us, and it’s no longer unrealistic to start dreaming about spring. Here on the West Coast, truly warm weather is a little further off than we’d like. Once the threat of snow has passed (maybe somewhere in mid-April), there’s still a few more months of chilly rain to cope with before the heat of summer has us all flocking to the beach. Those of us that mind the weather have to choose between umbrellas or cranked up thermostats. Personally, I’d rather be dry, but I do know that once the rain starts, warm weather is on the way. 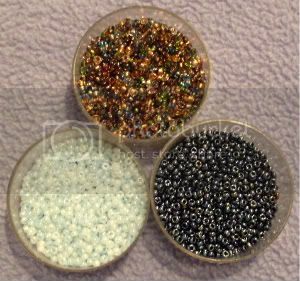 To evoke the gloomy hopefulness of spring rain, I’ve used a mixture of copper-lined seed beads that includes blue, green and mauve. The washed-out looking colors are a great way to represent watery streets, trees, and memories. For clouds, a combination of baby blue Ceylon and gunmetal make up a stormy sky. This laddered herringbone cuff uses the C/L mixture for a base, with the cloudy beads making up the bridges. I chose to make the bracelet reversible by alternating the blue and gunmetal. This way, the wearer can change the bracelet to suit their mood. The recent inauguration of the United States' first non-white president was a cause for much celebration. Even more important than the social impact of this historic event is the hope that our lives will soon return to what we considered 'normal' more than eight long years ago. Although I am not a resident of the US, I am still eager to see what changes this new presidency will bring about. And so is renowned beader, Margie Deeb. She is offering free beadweaving patterns in honor of recent events for sentimental and patriotic beaders alike. Check out her gorgeous Statue of Liberty design, available in Peyote/Brick stitch or Loom/Square stitch. 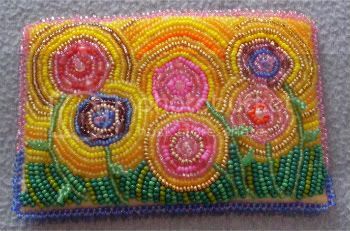 While designing a beaded coin purse for my niece, my first goal was to use pink flowers. Her favorite color is pink, so anything beaded must include that prettiest of colors. After deciding on an embroidered approach, I started having visions of pink and purple flowers surrounded by rays of yellow sunlight. The picture that formed in my mind was an eclectic garden full of bright, vibrant colors. I immediately thought of vintage cartoons, 70's album covers, and classic Sesame Street shorts. With little more than a lust for color, I set out to recreate my vision. I first pulled out three shades of pink from my seed bead stash. Bubble Gum AB, Opaque Hot Pink, and Galvanized Peach. Then I added a dash of Foil-lined Purple Mix and Matte Violet. For the stems I chose Matte Green, with Matte Yellow and Orange for the sunlight. As I worked on the purse, I found myself pulling even more beads out. 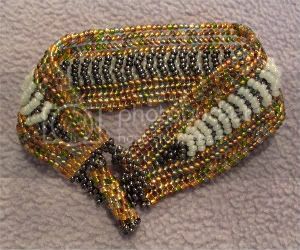 I wanted to add new rows of color and larger beads for texture. Some of my selections were Metallic Gold, and Opaque Yellows and Greens. The assortment of bead cups covered every inch of my workspace. In the end, the panel turned out just as I had hoped - better, even. 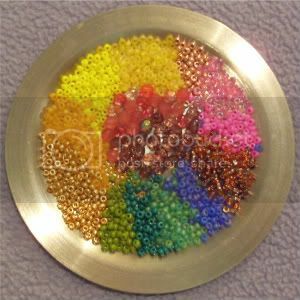 Each flower began with a 6o seed bead, with rounds of 10o beads moving outward. After each flower was given a stem and leaves, I set to work on creating the radiating sun beams. My goal was to include as many shades as possible, while keeping matte yellow as the main color. After adding some green, green grass and a picot edging, the purse was complete. I was almost sorry to wrap it up! Perhaps I'll have to make another for myself. From Western Maine, Sheryl Westleigh creates a stunning array of polymer clay sculpture and jewelry. 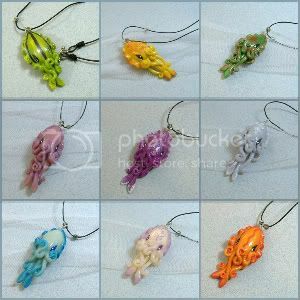 Most notably, her collection of unique cuttlefish jewelry captures a real essence of the sea. These marine inspirations are just the tip of the iceberg in a collection that includes woodland creatures, fantasy figures and mythical beasts. Surrounded by a real life menagerie of over 20 pets, Sheryl (aka Noadi) creates an amazing variety of inspired artwork, from pendants and earrings, to sketches and Perma-Pets. Inspirational Beading: How did you first discover polymer clay? Sheryl Westleigh: When I was in college I was wandering through a local art supply store and spotted some Sculpey 3 on sale, and I thought it would be fun to make some little miniatures for the Dungeons and Dragons campaign I was in. I never ended up making them but instead sculpted little heads and critters. IB: What is your favorite style or technique? SW: I started with polymer clay as a sculptor and that's still what I enjoy most. That's why even my jewelry is primarily sculpted and things like faux materials or caning techniques are secondary to the pieces, if they are included at all. SW: Definitely in nature. I think anyone who looks at my work probably immediately notices my obsession with cephalopods (cuttlefish, squid, octopus, etc). 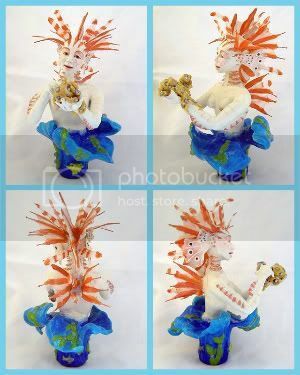 I also enjoy a lot of mythology and folklore and that often appears in my larger sculptures. 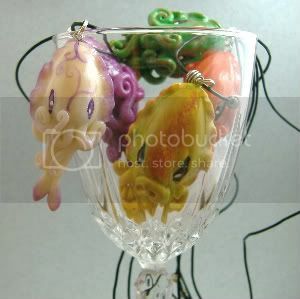 SW: Glass Attic is an amazing online encyclopedia of polymer clay techniques and it's my first stop if I'm looking up a technique. Katherine Dewey is an amazing sculptor with a pair of really good books, she also has a forum where she answers questions about working with polymer clay. For really amazing and often creepy sculptures the Shiflett Brothers are a team of sculptors also with a great forum. SW: You know I haven't really thought about that before. I don't think of myself generally as someone who does inspire others. [I’m more of] a teacher and I try hard to help other artists and crafters as much as I can. My mom is a teacher and I think that has rubbed off on me, which is one reason I recently started up a new blog about what I've learned running a handmade business. To learn more about Noadi’s Art, you can visit her gallery and shop at Noadi.net, or check in with her Adventures in Sculpting blog. In addition to photos and updates on her latest works, she also offers tips and tutorials on sculpture, design and handmade business practices. To purchase your very own Noadi originals, and learn about how to request custom orders, visit her shop on Etsy. Today was the first day back for students after the holiday break, which means that most vacationers are back home, unpacked and ready to launch their new slideshows. Although there is something wonderfully comforting about returning home after a trip, it's hard to get back into one's normal routine and say goodbye to that wonderful vacation spot. For beaders, possibly the most wonderful thing about visiting an exotic location is the unique selection of beads one can find. Personally, I dream of bringing home strands of mummy beads from Egypt one day. Because beading is such an ancient and culturally universal art form, nearly every vacation spot in the world has something to offer us. To drive away some winter blues, and remember vacations past, it's time to stitch up something tropical and exotic. 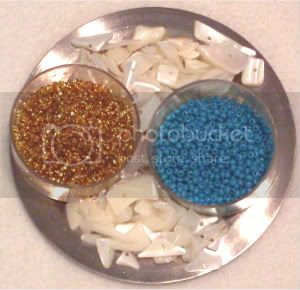 For memories of a sandy beach, I chose gold foil-lined beads. They have a bright sandy color, but plenty of sparkle, like white sand in the sunset. A nice opaque turquoise will make the glassy blue sea. To top it all off, I threw in some mother of pearl chips. Altogether, this bead selection is like a beachcomber's dream. 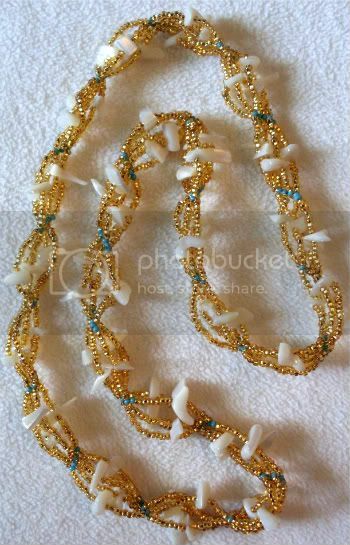 This necklace was made with tubular netting on a large scale. The blue beads provided the columns, with the MOP and foil lined beads forming the netting. After only a few rows, the tube was full enough for a slinky, summery necklace.